Many of us go about our busy days not paying much attention to the life that is all around us, that is the wildlife. All species of life found in nature, large and small, have evolved unique adaptions and skill for their survival. All life in nature from insects to large mammals are very skilled in the specific tools needed for their survival. Any focused examination of life reveals the remarkable way each species has devised unique methods to survive. By way of example, let’s look at the Wood Duck. 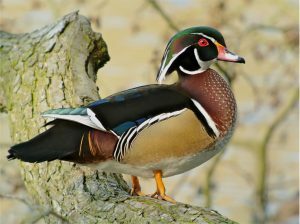 The male Wood Duck is one of the most beautiful birds in America. That aside let’s examine how it has adapted for long-term survival. 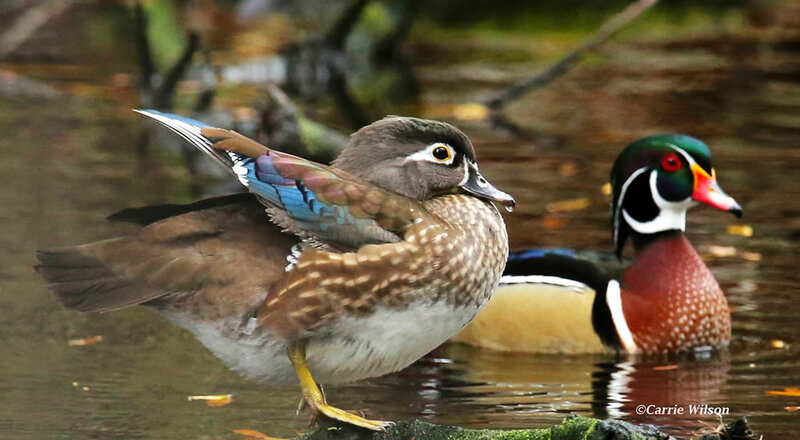 Wood Ducks nest in trees that border a flowing water source. 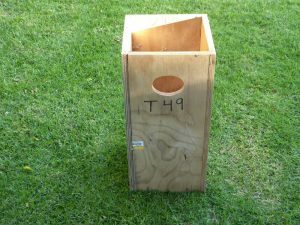 They usually nest about 12-15 feet above ground either in natural cavities or in nest boxes. The hen and drake begin looking for nest sights in early spring. Once they find a suitable nest the hen begins laying. And it is at this time the Wood Duck puts into play its bag of survival skills. The hatchlings must get to running water within 24 hours of hatching. That means they must all hatch at the same time. It’s the only way the hen can protect them. They must be together and with the hen. So here is what she does. 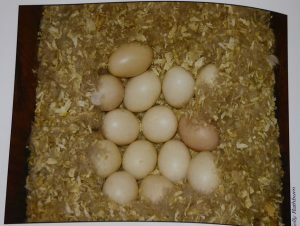 She will lay one egg each day for an average of 13 days. The clutch of eggs will be equal to her body weight. When most of the eggs are laid she will begin to pull down feathers from her chest to blanket the eggs. The eggs will be fully covered with a thick cover of down. This keeps the eggs warm when she is off the nest for feeding twice a day. Once the eggs are fully covered the incubation begins. 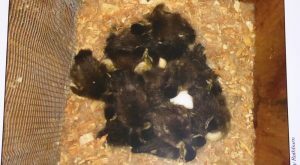 The eggs hatch in 29 days, all on the same day. So she has 13 hatchlings to get to water. 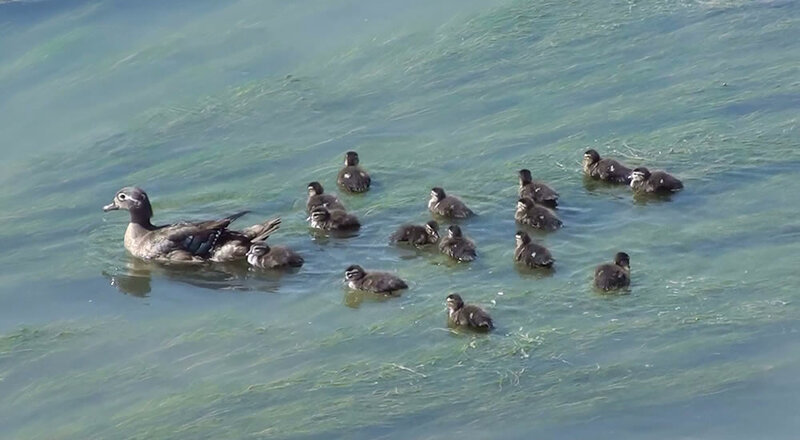 24 hours after the hatch they all leave the nest and follow her to water. In order for the hatchlings to climb out of the cavity nest they have grown little claws on their feet, which they use to climb. When at the entrance of the nest they jump, falling 12-15 feet to the ground. They surely can’t fly so they hit the ground, bounce, and begin the trek to the water for protein and protection with mom. Hatching the same day, climbing out of the nest the very next day, being only 24 hours old, surviving a 15 ft. fall, and joining mom in the water is pretty good stuff. I think the Wood Duck has adapted pretty well.